A Tribute: To A Victim | It's not my fault. It was a dark and drizzly night in late February as I rounded the sidewalk towards the old flickering neon sign. “Tattoo” it read in a fuzzy faded pink lettering. This was definitely not the type of establishment I would normally venture into but tonight I had an appointment with a well respected artist named Jim. I was given his information by a friend of mine and had admired his work already first hand. Jim was a legend in the tattooing world. If I was going to permanently alter my body it had to be done by the best. As I pushed open the old door, chimes rang out in an attempt to alert a non-existent staff. I found the shop to be virtually empty, except for an old bearded man sitting next to a table reading a dusty magazine. He lifted his head up as I entered followed by a slight nod of acknowledgment. “I have an appointment with Jim,” I stated. I took at seat across from the old man placing my hand on the counter top of the tattoo table. “What can I do you for today, Mam?” he asked in a subtle tone. 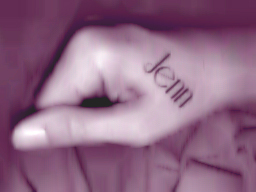 “I would like the name, Jenn, inked across this side of my hand,” I instructed, gesturing as I spoke. “Ahh, I understand. Jenn was my best friend. She died one year ago today. I would like to commemorate her life with this symbol of my love and admiration,” I explained. My thoughts began to trail off as Jim turned on his machine. The white noise was as soothing to me as meditation. I didn’t feel pain when the needle struck my skin, instead I was enjoying the vibrations. My mind began to race as memories of the night I lost my dear friend flooded into my brain encompassing my thoughts. It was just one year ago today that I sat alone in my den strumming my guitar. I had a joint in my mouth and was feeling relaxed as I created an acoustic version of one of my favorite songs by Joy Division. “Guess you dreams always end. My phone began to ring, creating a sound louder than my guitar, pulling out of my Zen. I grabbed it from off the sofa and took a glance down at the screen. It read, “Jenn.” I was debating taking the call as I had already told her the night before not to bother me after work. She knew this was my alone time. I decided to reject the call and continue my song. Hey don’t you know you were right? I missed a few chords and was becoming frustrated. The sudden interruption of the phone call had broken my concentration. As the anger increased the phone again, started to ring. Only this time I answered. “Hello?” I asked in a cold tone. “I’m so glad you picked up! I really needed someone to talk to tonight!” Jenn just barely spit out through her muffled sobs. “I know, I’m sorry. I wouldn’t have called but this is important,” she insisted. “How can you be so cold?” she asked me. I was more than tired hearing about her problems. She had become so selfish and needy. This was not the friend that I thought I had. Each time he cheated on her she would tell everyone. People were beginning to look down on her and quite frankly, by associating with her, I was being looked down upon too. Why could she not see what a burden her repeated behavior had become on me? “How can you be so weak?” I asked. “Okay, I’m going,” she promised as I hung up my phone. Once again, I picked up my guitar. I was suddenly performing up to par and decided to set up my equipment to create a recording. Once it was finished I played it back to myself. It was beautiful, almost perfect. In a mini celebration I sparked up another joint and began uploading my finished work onto the computer. It was just close to complete when the phone rang. Once again it was Jenn. “I told you that I am busy,” I scolded after picking up. “I can’t live this way anymore! I would rather die!” she shouted into my ear. Her voice was shaken and hysterical. “Great, you are halfway there!” I mocked. “I’m serious, I am going to kill myself,” she was now screaming into the phone. BANG!!!!!!!!! The sound of the gun rang out leaving behind a slight ring in my ears. “Jenn? Jenn?” I let out a small chuckle when she didn’t respond. After ending the call, I walked over to my computer. My download was now complete. I took another puff off my joint and moved the mouse over to the play button and clicked. There it was already, broadcasted live and people had begun to comment on my obvious talent. A proud chill of achievement ran down my spine. “It’s a masterpiece!” I said exhuming a wide spread grin. Suddenly I was jerked out of my thoughts. I blinked a few times and then looked down at my hand. “I’m glad you approve,” Jim said acknowledging my compliment. I paid the bill, handed Jim an extra $20 for his competent services and headed back out onto the wet street. The rain had picked up quite a bit so I pulled the hood of my jacket up over my head and began singing to myself. My finger hovered over like for a long while. I can’t do it. My first thought is “I dont know if this is true,” then “even if it’s not true……” So, that being said I like the prose. I like the self-evaluation and reflection it brought. I like this story getting out there. I don’t like the memory it brings. I don’t like the outcome. I don’t like the pain of the woman left behind. Oh, pshew! Awesome job! You are a phenomenal writer! Rock on girl! It’s written from the perception of a sociopath. oooHHH. That makes sense. Sadly, there are people who are like that who would never be “labeled” as a sociopath. I would use the term sadist here too. Yes, the world is far more populated with sociopaths then we think! I have had a lot of experience with them personally…I’m letting it all out via blog! Oh girl! Me too! me too. Thank you so much Nodimlight! I wonder if a sociopath would have gotten the tattoo? Very well written, but it seems that there is a conflict between paragraph nine and then the historical reflection of her attitude toward Jenn. What do you think? Gonna look it over! Thanks for the input! The tattoo symbolizes a trophy from having succeeded at murdering a victim through nothing but words. Its the perfect crime. Aha! That’s good. I will read it again. Wow what a true life story. You are an excellent writer! Keep it up. Thank you so much Omtatjuan! Wow, just wow. This is so compelling, it took me a while to accept it as fiction! Thank you Bloggirl! Your compliment means a lot! I’ll be back to read more. So, did you base your sociopath on anyone you know? Like most writers, my work is inspired by real life events. Everything I write is actually interlinked. If you want another piece of the story all you have to do is follow the hidden links. Within this post, the word “grin” will take you to another piece of the puzzle. Sometimes the missing piece is in the comments. Happy hunting! That’s so clever! I am IMPRESSED X! Are these real events? All these quotation marks … it looks like dialog from a novel. Sigh. Oh Matthew, again? I write fiction. Like many writers I take my inspiration from real life events. But yes, the majority of my blog posts are stories from my books. That was intense! I’m glad it was fairly short… it’s late and I would’ve been sucked in for however long it read. Great work! Very Intense. Fiction I hope. Very impressive writing!